Missile Command has a great game concept. Back in the days, when you would play this game on your Atari it would become more and more intense as you progressed in the game. At first it would be cool and easy to take down the incoming missiles. But when you advanced the number of missiles, speed and variety become much more intense making it a pretty hard game to beat. And then again can this be beat? Does it ever end? This is one of those classic titles that will never bore. That's what Minionsoft must have thought also when he remade this game for Windows. The Windows version is a lot more polished then the 1980 version was. 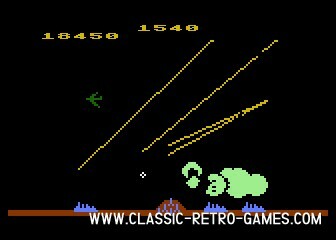 This Windows remake of Missile Commmand has excellent graphics which makes the game even more enjoyable. However, the goold old game play is still here. What are you waiting for? 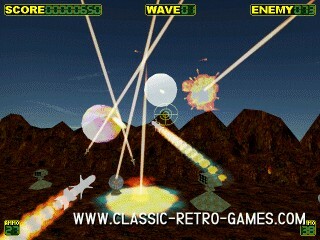 Download this remake and enjoy Missile Command on your Windows PC ! Currently rated: 3.6 / 5 stars by 5 gamers.